"Beyond Blood is a paranormal thriller with well-drawn characters, international backdrops and plenty of danger, mystery and intrigue to keep the reader turning the pages non-stop. When Carrie Phillips, a wealth-management expert, receives a desperate phone call from her best friend and client Roxanne, she flies to St. Lucia in the Caribbean to find out why Roxanne believes she is at risk. Thus begins a strange tale of Roxanne’s mysterious Trust Fund, her violent ex-husband, her suspicious current husband, and an evil benefactor with sinister plans. Other nefarious characters and juicy secrets help to create suspense in a well-thought-out plot. 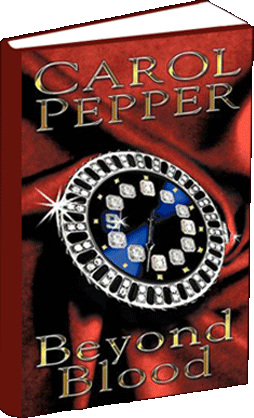 Kudos to Carol Pepper for a compelling debut novel." Barbara Taylor Bradford is the author of 27 novels; all have been best sellers. Her books have sold over 83 million copies and have been published in over 40 languages and in more than 90 countries.